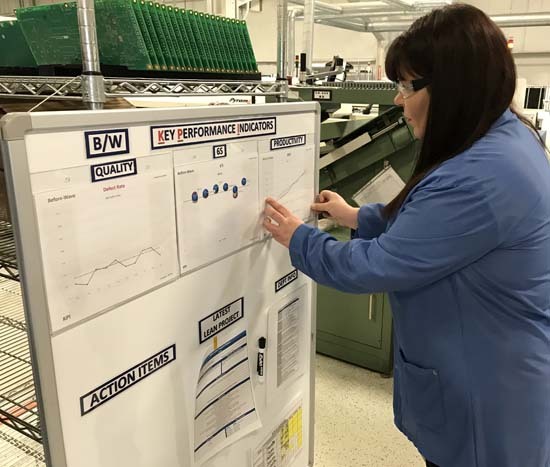 Tiffany Janelle, wave line leader at Altek Electronics, checks the key performance indicators (KPI) board to oversee productivity, quality, and Six Sigma issues. Photo by Mark Langlois. Altek, a PCB assembly company founded in 1972, insists on knowing its customers for superior customer service. When Altek Electronics Inc. CEO David Altschuler talks about understanding the company's customers, he means he visits the customer's plant once a week, walks through security wearing the badge they gave him 18 years ago, and he talks to various people in the receiving department, production, engineering, and supply chain about what they need and how Altek is performing. While he's doing that, his father, Stephen Altschuler, Altek's founder, is visiting another customer to learn what that customer needs. In that meeting, Stephen Altschuler is meeting directly with the customer's founder because that's how old their relationship is. Sabrina Altschuler Beck, a co-owner of the electronics manufacturing firm, visits other customers as needed, always with the goal of building the relationship, not only delivering a part. "It's not just because we ship a good quality product. It's all about the relationship and doing what they need, when they need it," said David Altschuler, in an interview in early February at the company's plant in Torrington, Connecticut. "It's so much more than just 'Get an order and ship it.' You don't have to be there every single week, but it helps. Because when you're there and they want to ask you a question about how to solve a problem, it's easy. If you're not there, they're going to look for somebody else. Being there creates opportunity." Altek (www.altekelectronics.com), founded in 1972, serves customers in the medical, industrial, and military markets, among others, by designing and assembling printed circuit boards, box controllers, and wire assemblies. With annual revenues approaching $30,000,000 the company employs roughly 190 people in a factory that is about 40,000 square feet in size. Altek's quality certifications include AS9100D, and ISO 9001: 2015, while solderers are certified to IPC-610 and the J-STD, and cable and harness operators are certified to IPC-620. 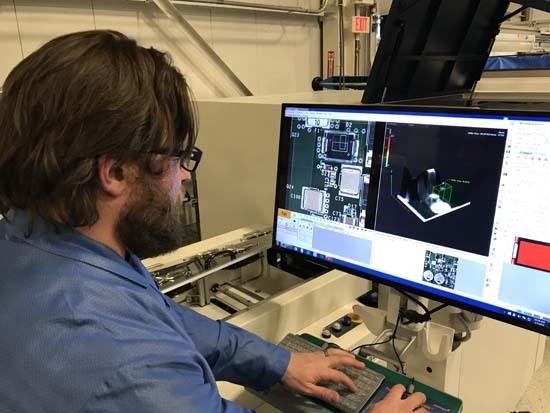 This quality focus is all going on while Altek immerses itself in lean manufacturing training for its employees, an ongoing project that started nearly 20 years ago. Dozens of employees have been trained to date, and more training is planned for 2018, including training Altek supervisors on how to train their own employees. "I'm at a major customer every single week, and sometimes multiple times a week," said David Altschuler. "I'm in either their service/production location or at their engineering/design center." Altschuler doesn't get stopped at the door anymore because his identity badge is 18 years old. "There are times I get there and there are five or six people looking for me. We are not just there to visit–we're there to help them keep products flowing without hiccups and resolve potential problems." Altschuler said Altek isn't only providing parts for its customers. It is building a relationship week by week, year by year, involving as many people as is practical. Altek's goal is to build a deep relationship beyond "We build you a part." These routine weekly problem-solving visits might include the ongoing struggle to figure out how to remove parts from the process, or how to find rare components, or bulking up inventory of parts that are about to be discontinued. Even harder, it could mean finding replacement components for parts that were discontinued years ago. "We're always trying to find ways to take cost out of the product," Altschuler said. Altek employs 11 engineers, including software engineers, production and process engineers, and electronics engineers. "Companies ask, "Can you help take cost out of this product? And then they ask the same question the following year." Operations Manager Ravi Kailan said workers are constantly asked to try to cut waste and improve efficiency inside Altek. That is part of the company's ongoing lean manufacturing training and Six Sigma efforts. Kailan said Altek produced nearly 900 distinct parts last year in quantities ranging from one to 3,000. In the last 12 months, Altek increased its output from roughly 2,000 to 2,500 pieces a week to 3,500 to 4,000 a week. "Our customer base is also growing, and our current customers have increased their demand. As the entire economy is growing, everyone is doing more," David Altschuler said. 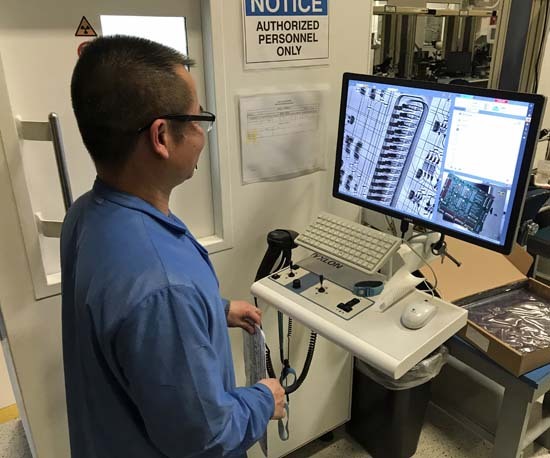 Namanh Phan, process engineer, uses the automated optical inspector (AOI) to look inside electrical components and check soldering joints on ball grid arrays. Photo by Mark Langlois. Sometimes when Altek employees visit a customer, they gain a clearer idea of what problems the customer faces. On these visits, Altek workers bring Lean Manufacturing principles to bear, as required. Kailan is a Six Sigma Black Belt. Over time, Altek is training all employees in lean techniques. Last year ( 2017), all supervisors and managers–12 people–on the production floor went through a four-day lean certification program. Two line leaders have been trained this year. "All of this is helping us remove the waste from our facility while improving quality," Beck said. Kailan said that Altek estimated 4,200 hours of savings from its lean events last year. "We have verified 2,800 hours," Kailan said. In all, in 2017, Kailan said Altek reduced costs through its lean efforts by an estimated $108,000, and out of that, $60,000 has been verified. One example of that arose after Tiffany Janelle, a line leader, completed lean training. Janelle said she worked in day care before joining Altek, but it wasn't for her. She wasn't sure about working at a factory. She doubted she would enjoy sitting at a bench all day making things. She discovered she loved it, and when one of her line workers isn't at work, she looks forward to sitting in for them. When Janelle returned from Lean Training, she figured out how to shave time off a PCB assembly that took 45 minutes. The process was fully automated, and Janelle figured out how to build the PCB partially by machine and partially by hand for a 20 minute savings. "Here, 20 minutes is a lot," Janelle said. "We were pretty excited about that." When one customer called Altek to describe a problem they faced with shipping, Sabrina Beck, Altek vice president and owner, visited the customer with Kailan, the operations manager. They found the customer's problem was Altek's elaborate packaging to protect the PCBs. The customer's assembly line was buried in Altek's pink bubble wrap. "They were more embarrassed than anything to say "Please don't package it like this," Beck said. "It's wonderful you're taking this care, they said, but we're only 45 minutes away. They had a mountain of packing material next to the production line that told the story of what we had to do better," Beck said. Once Beck and Kailan saw the problem, they understood what they needed. First, the packing method consumed too much time–time at Altek and time for the customer. It took about several minutes at Altek to package it, and then it took another three minutes at the customer's facility to open the box, unload the product, and stack the packing material. Their solution changed the packaging and the packing materials. Instead of packing the assembly in a cardboard box layered with alternating bubble wrap and product, they switched to a rolling cart with shelves, but no bubble wrap. Each printed circuit board is inserted side-by-side in an ESD-approved foam frame with a few inches between the assemblies. The rolling cart is then zippered closed and driven by van to the customer. The cart is rolled into the factory, unzipped, and the assemblies are unloaded on the line as needed. The cart and foam frames are returned to Altek. Workers at both factories saved five to seven minutes packaging and unpacking the PCBs. Little or no waste was left at the customer's plant. "It's now down to 25 seconds," Beck said. "We're saving from less waste. We're saving time from people who don't have to open boxes." Brandon Martinelli, production engineering manager, reworks a ball grid array on the BGA reworking station. Photo by Mark Langlois. Altek's engineers, including company founder Stephen Altschuler, constantly tackle projects to lower costs and improve efficiency. "They meet every day, and every day they're working on a project," Beck said. Altek engineers create test fixtures to better test circuit boards. An assembly with, for example, 700 connections, might take 50 hours to test. Altek is always looking for ways to shorten that time. "We found a way to do this testing in far fewer hours," Beck said. "It took months to develop. It went from taking us 50 hours a week to 10 hours." One improvement the engineers installed was a test fixture called a "bed of nails." A person places the PCB on the bed, presses it into place, and a few seconds later, the PCB is tested. Each circuit on the PCB is checked that fast. "We've written software for testing, to create a better human interface. It's an ongoing effort to reduce waste," Andy Zaharek, Altek's senior test engineer, said. "We might write a piece of code that will step an engineer through the review process more quickly." Why the emphasis on reducing costs? "We're in Connecticut; it's a high-cost state in America, a high-cost country. In order to compete with companies who do what we do overseas, we need to find ways to reduce costs, remove waste, and become more efficient," Beck said. To cut costs in the bidding process, Altek uses software that gathers prices online from suppliers without human interaction. That both lowers costs and avoids human errors that might arise when a person types in numbers from various suppliers. "So that helps us improve lead time on quotes to customers, and it reduces the amount of work it takes to get the quote done," Beck said. "We're harnessing technology to increase the speed of quotes and reduce the cost of quotes." Altek customers want products fast and they want high quality. Kailan said if a customer asked for a part in two weeks, and today they call to say they need it the day after tomorrow, Altek starts racing. "We're going to rush," Kailan said. "That's the trend in the last few years. It's a good mix of racing and doing more controlled production." Despite the short deadlines, quality is always important. "If you do quality right, speed is going to come," Kailan said. "If you focus on quality, you're not doing it twice. You're not reworking it. You can focus on the speed to get the part out the door. Quality has to be the first focus." "Stephen's focus from early on was to make it easy to do right and hard to do wrong," said David Altschuler. So Altek and its engineers are working constantly to give employees the tools they need to make the part properly. "And we have tools available now to do that." One example of such a tool is Altek's digital traveler. It is a database of instructions and photographs that tell workers exactly how to make a part. The photos remind workers of what it looks like as the part progresses through manufacturing. A student from Oliver Wolcott Technical School in Torrington brought the idea for a "digital traveler" to Altek, and Altek gave him time and training to create it. "It's how we run the entire factory now for presenting documentation on how to build something. And if something is changed or updated, everybody has immediate access to it right away," said David Altschuler. "And if they have comments or suggestions on how to do something better, they have immediate access to the engineers who create those documents. So, if somebody said it would be better if I had that image, or you had this wording, or if you could make this a different language, we can do that right away. So it's easy to do it right and it's hard to do it wrong."